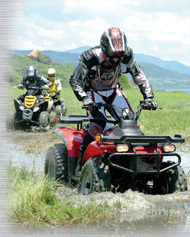 E-Ton Australia has been providing quality ATV's, SUV's and Mobility Scooters in Australia since 1999 and conforms to internationally recognized manufacturing and engineering standards such as ISO9000. Packed with features, reliability and quality, E-Ton Junior Quads are one of the biggest selling junior ATV's in the United States of America and we are now seeing extensive growth throughout Australia . E-Ton products are produced by the same company that supplies OEM components to Yamaha, Volvo, Ford, Mazda, Nissan, Renault, Cummins and many more. During 2004 a flood of cheap, low quality ATV's and mini bikes from third world countries flooded the Australian market. Buying a cheaper ATV that lacks a single Australian distributor and dealer network, will leave you waiting for costly and hard to acquire spare parts and will prove to be an expensive exercise when the cost of repairs, low performance, safety concerns and lack of spare parts are all taken into account. Like all major brands, E-Ton Australia offers a six months parts and labor warranty and a full spare parts back up. If your authorized E-Ton dealer needs spare parts or warranty back up, they can be acquired directly from us here in Australia and generally within a few days from time of order.